The smear campaign against the newly-departed continues in earnest, as state and university officials confirm he never held an in-state driver's license. Throw away the key! We're on day 10 of Kiffygate, and the self-appointed Howie Spiras of Knoxville are going to find every traffic violation, every late library book, every time Layla forgot to pick up after the dog. Todays outrage: Kiffin failed to change his California license to a Tennessee one, even though new residents must apply within 30 days of moving. Horrors. A search for the name Kiffin fails to turn up a single driving record statewide, said Mike Browning, spokesman for the Tennessee Department of Safety. 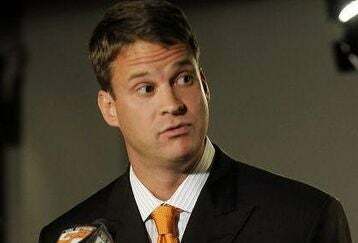 "Lane Kiffin does not have a current valid driver license in Tennessee," Browning said. State law classifies failure to change over a license as a misdemeanor punishable by a fine of up to $50 and court costs. A UT spokesperson chalks it up to a simple misunderstanding, but I smell a conspiracy afoot. Kiffin moves from Oakland but hangs on to his California license...and then moves back to Los Angeles a year later? It's almost as if he knew he'd flee Knoxville, and didn't want to spend the $40 bucks on getting his license changed twice. Lane Kiffin is a criminal mastermind.